Pars dorsalis and pars ventralis are the 2 major parts diencephalon is split into. These subdivisions are divided from every other by a shallow groove, the hypothalamic sulcus, which goes from interventricular foramen to the rostral end of the cerebral aqueduct of the midbrain and are viewed in midsagittal view of the brain. Pars dorsalis is located above (dorsal) the hypothalamic sulcus and is composed of: thalamus, metathalamus and Cepithalamus. 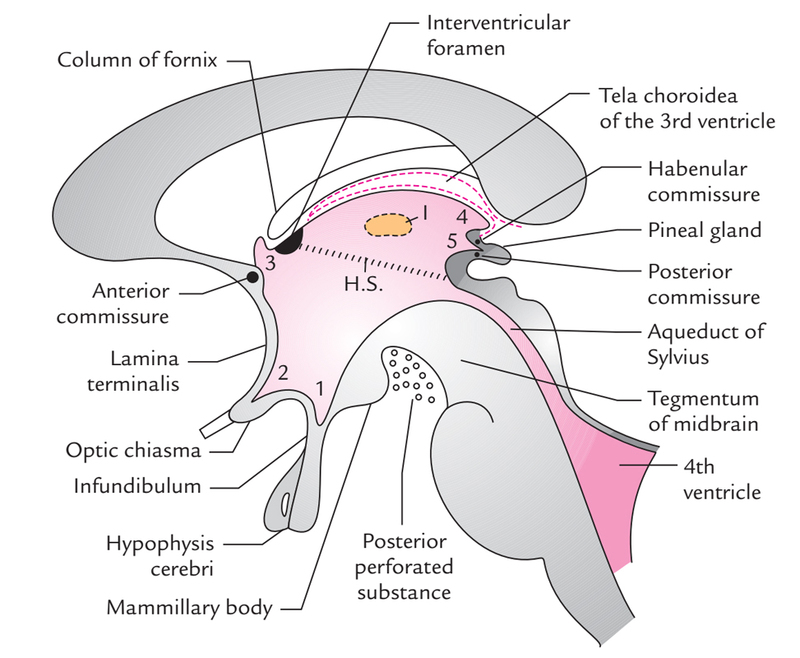 Pars ventralis is located below (ventral) the hypothalamic sulcus and is composed of: subthalamus and hypothalamus. Every of these parts have additional subsections. The thalamus (thal’-ah-mus) consists of two lateral masses of nervous tissue that are joined by a narrow isthmus of nervous tissue called the interthalamic adhesion. Sensory nerve impulses (except those for smell) coming from lower regions of the brain and the spinal cord are first received by the thalamus before being relayed to the cerebral cortex. The thalamus provides a general but nonspecific awareness of sensations such as pain, pressure, touch, and temperature. It seems to associate sensations with emotions but it is the cerebral cortex that interprets the precise sensation. The thalamus also serves as a relay station for communication between motor areas of the brain. The hypothalamus (hi-po-thal i-ah-mus) is located inferior to the thalamus and anterior to the midbrain. It communicates with the thalamus, cerebrum, and other parts of the brain. The hypothalamus is the major integration center for the autonomic nervous system. In this role, it controls virtually all internal organs. 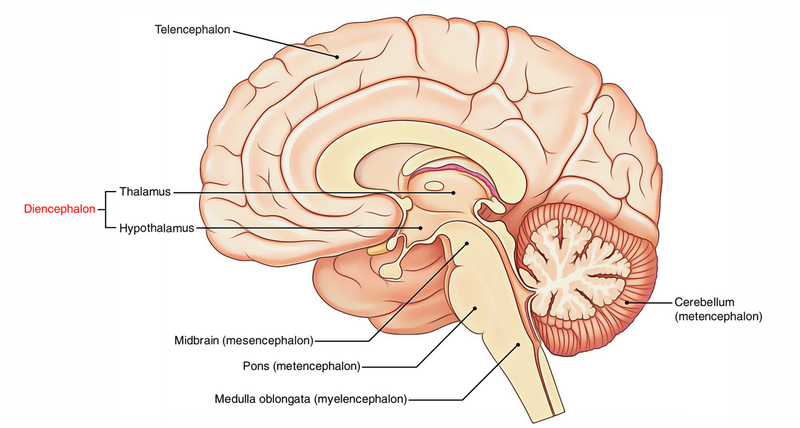 The hypothalamus also is the connecting link between the brain and the endocrine system, which produces chemicals (hormones) that affect most cells in the body. This link results from hypothalamic control of the hypophysis, or pituitary gland, which is suspended from its inferior surface. Although it is small, the hypothalamus exerts a tremendous impact on body functions. secretion of hormones by the pituitary gland. The metathalamus is composed of 2 rounded medial and lateral geniculate bodies which protrude from the posteroinferior surface of the thalamus. The medial and lateral geniculate bodies create relay stations for the specific senses of hearing and eyesight, respectively. The epithalamus is a small area of diencephalon, posterosuperior to the thalamus. It is composed of pineal gland and habenular nuclei. The pineal gland plays a significant function in controlling the onset of puberty via its secretion. The decrease in pineal secretion precipitates puberty. The pineal gland is also involved in sleep-wake cycle. The habenular nuclei have olfactory and limbic connections. They may be affected by odor and are involved in psychological and visceral reactions to smells. The subthalamus is a small area of diencephalon that is located between the thalamus and the midbrain. It includes several nerve tracts and the subthalamic nuclei that are related to basal ganglia and are involved in controlling motor functions.